I heard the news last night that Steve Jobs had died. It's truly sad day for the entire world he helped change. There aren't many people you can call a true visionary, but Steve was one of them. I've been using Apple products for most of my adult life. I spent about an hour sketching him on one such device last night. Excellent Job Mark, I run sketchoholic and Sketchozine dot com. We'd love to use two of your Steve Jobs paintings in our TRIBUTE book to STEVE JOBS and make it part of our Steve Jobs Tribute contest. You may view the Digital Book online at www.sketchoholic.com/flipbook/stevejobs and visit [link] for more information on the contest. I hope to talk to you soon. He was a great man. This is a lovely drawing. Why do you squash people's faces like that? its almost insulting to the people you draw. It's a style of drawing can't remember what it's called though plus i don't think Steve would be insulted by this more likely happy. happy that his face was represented as a squishy thing? "Happy" was a bad word to use if you would say amused instead. You know what i mean? Well I understand that some people don't get amused by this, since they most likely lack sense of humor. Was humor the intent of this artwork? I think it was actually. But like i said you wouldn't know. Are you familiar with caricatures? That's often the approach. Some feature of the person is exaggerated. In this case, this artist saw steve in this light. Some of the greats worked for Mad. Tom Richmond is one of the tops in the field right now. Yes i am, and in my opinion i think its a repulsive approach to depicting people in portraits. Of course art being completely subjective, it's not for everyone. I personally love a good caricature. I'm amazed at how many different ways a person can be viewed. I just got a new fav to my collection! This is really good! The world is a little more dim now in more ways than one. This is an amazing portrait. It is unfortunate that he died. He was a wonderful and genius man. A true visionary indeed. May I please feature this drawing on my journal for the Steve Jobs Tribute I built? RIP Steve, well done on the sketch. I agree Jobs was a visionary. Great Piece. 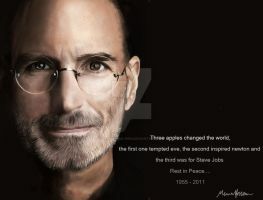 I don't like apples products but theres no denying this man was at the roots of SO much innovation. R.I.P steve. It's safe to say that whether you are a PC person or a Mac person, you recognize the impact he had on the industry.